Written by David Ross – Highland Correspondent, The Herald – 02.10.2012. “He could still close his eyes, see the boats heading out to sea and hear the unique speech pattern that set his people apart. 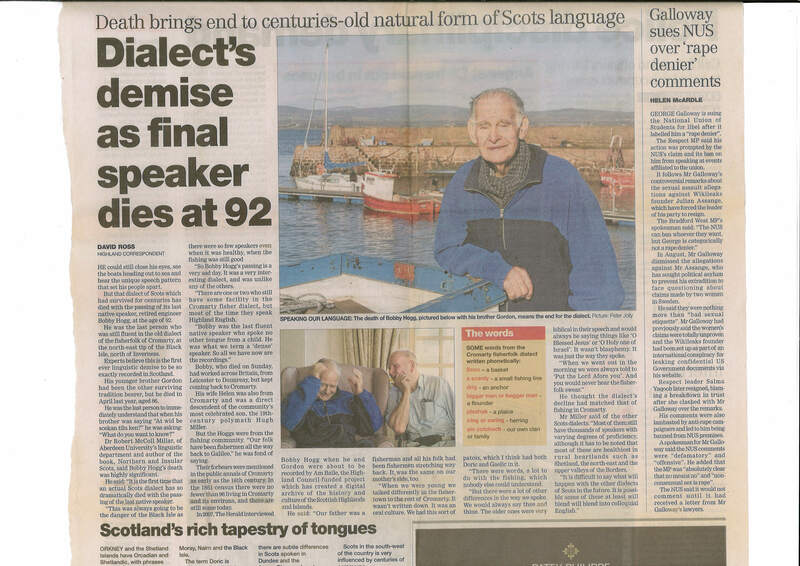 That dialect of Scots which has survived for centuries now dies with the passing of its last native speaker, retired engineer Bobby Hogg, at the age of 92. Bobby Hogg was the last person who was still fluent in the old dialect of the Fisherfolk of Cromarty, at the north east tip of the Black Isle, north of Inverness. Experts believe this is the first ever linguistic demise to be, so exactly recorded in Scotland. Bobby Hogg’s younger brother Gordon had been the surviving tradition bearer, but passed away in April last year, aged 86. Dr Millar can be quoted as saying, “It’s the first time that an actual Scots dialect has so dramatically died with the passing of the last native speaker. This was always going to be the danger of the Black Isle as there were so few speakers even when it was healthy, when the fishing was still good. “There are one or two who still have some facility in the Cromarty fisher dialect, but most of the time they speak Highland English. In 2007 the Herald interviewed Bobby Hogg when he and Gordon were about to be recorded by Am Baile, the Highland Council-funded project involved with the creation of a digital archive documenting history and culture of the Scottish Highlands and Islands. “When we were young we talked differently in the fishertown to the rest of Cromarty. It was an oral culture. We had this sort of patois, which I think had both Doric and Gaelic in it. Mr Hogg thought the dialect’s decline had matched that of fishing in Cromarty. Dr Miller also spoke of the other Scot’s dialect: “Most of them still have thousands of speakers with varying degrees of proficiency, although it has been noted that most of these are healthiest in rural heartlands such as Shetland, the North-East and the upper valleys of the Borders.